A POWERFUL AND PRESCIENT THRILLER FROM THE MILLION-SELLING AUTHOR OF I'LL KEEP YOU SAFE, COFFIN ROAD AND THE BLACKHOUSE. Jaded Edinburgh journalist Neil Bannerman is sent to Brussels, intent on digging up dirt. Yet it is danger he discovers, when two British men are found murdered. One victim is a journalist, the other a Cabinet Minister: the double-assassination witnessed by the former's autistic daughter. This girl recalls every detail about her father's killer - except for one. With the city rocked by the tragedy, Bannerman is compelled to follow his instincts. He is now fighting to expose a murderous conspiracy, protect a helpless child, and unmask a remorseless killer. I was disappointed to find this was a re-issue of a book written in 1980s. A good readable story but very dated .........The author's more recent books are more 'punchy' and real page-turners. I had to 'plod' through this one but enjoyable all the same. Another great read/listen by Peter May. Enjoyed it from beginning to end. 3.0 out of 5 starsPeter May = Guaranteed Good Read. Thankyou to NetGalley, Quercus Books and the author, Peter May, for the opportunity to read a digital copy of The Man With No Face in exchange for an honest and unbiased opinion. I thought this book provided a good read. The storyline was well thought out and written with well developed characters. It was a very intriguing tale. Have always found this author to write gripping tales and this one was no exception. I have never been let down. 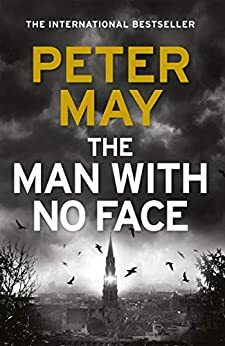 As I understand it, this was one of Peter May’s first books, republished with some minor updates. This being the case makes it even more impressive. Having read everything he writes this is right up there with his very best Hebridean stories and I hope the characters he has created will get a new lease of life in a series of sequels! I for one cannot wait. The hard nosed main character he builds up and then unlocks a deep rooted compassionate man with the most unlikely “heroine “ is very endearing. Brilliant plot beautifully crafted and executed. His later books are better. Characters not as well developed as later books. Conclusion not as satisfying as expected. Never read his books before and am very happy that they re-released 'the man with no face'. This early work has to be read if you like the genre. What a relieve to read a book that has been written quite a few years back and feels and reads so much better than many contemporaries, who although respected now are minor compared to the "Man with no Face"
5.0 out of 5 starsA great read! True to form May has produced another intriguing tale. Credible characters, brilliant descriptive writing bringing alive the settings and a worthy plot. Heartily recommend. 4.0 out of 5 starsThe book is a re-release first distributed in the 80's. The storyline is tight, full of richly built characters with a plot that keeps you tied to the book until the very end. Then you want a glass of your favourite to sip while reflecting on what you have just read.